I seem to have fooled many of you into believing my travels, and therefore this never ending diary, have come to end. But as you all know it is not over until the fat lady sings, and I haven’t as yet sung a single note. We disembark the ship at Athens and go straight to the airport. 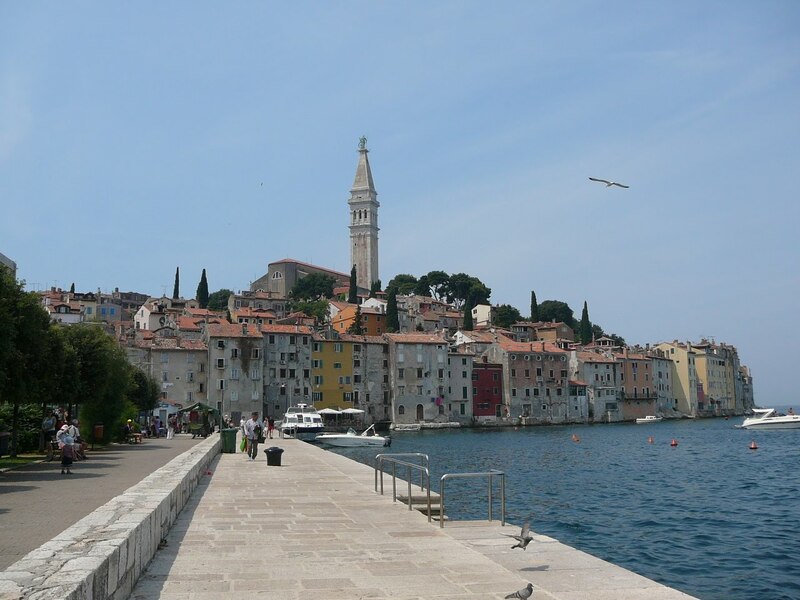 We are due to spend 6 days in Istria to relax after all the hard work of cruising. For those of you like me who have no idea where Istria is, it is part of Croatia. For those of you like me who can’t quite locate Croatia on a map either, it stretches along the coast of what used to be Yugoslavia, which is now divided up into a plethora of tiny countries, all with forgettable names and most, amazingly, with their own language. Istria is right at the top of Croatia , a small fist punching out into the Adriatic, which has only recently come out of relative obscurity. It’s stunning coastline and dramatic countryside have finally caught the attention of European tourists. To get there we fly to Trieste and pick up a rental car. We first have to drive through Slovenia, which sounds like a drag name waiting to be chosen by some aging, third rate, overweight drag queen with a hygiene problem, but is in fact incredibly beautiful (or the small bit we drive through is). How can anywhere with such an unappealing name be so gorgeous? Istria, blessed with a slightly more appealing name, doesn’t quite match up to Slovenia in the looks department, but comes in close second. 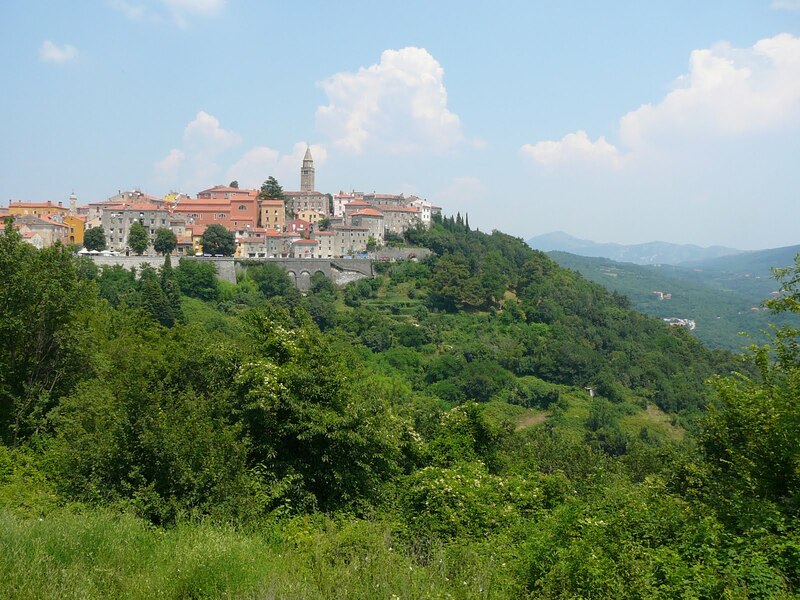 The countryside is a visual feast with steep sided mountainettes (well they are too small to call mountains and too steep to call hills), adorned with small red roofed villages perched on top peeking through the surrounding woods. Everywhere is impossibly green, thanks in part to the deep red fertile soil. The coast too is visually stunning, lined as it is with the sparkling blue and dramatically clear waters of the Adriatic and dotted with little islands, some close enough to swim to, others just a short ferry ride away. And there are boats everywhere. It seems that even the smallest coastal village has a marina and the marina is often bigger than the village. It has all the makings of paradise but sadly it does not set off the fabulosity meter. Firstly there are very few accessible beaches. Those that there are, are narrow strips of shingle. If you can’t find a narrow strip of shingle, then there is no option but to sunbathe on, and swim from, the rocks. At least the rocks in many places have been dotted with small patches of concrete to give a place for people to sit, however uncomfortably. But being from England, I am used to uncomfortable beaches, where there isn’t even the beautiful Mediterranean Sea to make the discomfort worthwhile. The lack of beaches doesn’t bother me, but what does are the tourists that sit on them. First of all the vast majority of them are Germans, and Germans on a beach means two things – very large men in very small Speedos and very large women in very small bikinis. It is not pretty and becomes even less so on the many nudist beaches. The only saving grace on the nudist beaches is that the rolls of fat often obscure the bits that I have absolutely no desire to see. Some of the nicer beaches (by that, I mean those with smaller pebbles) have hotels directly behind them. The hotels line these beaches with chaises, and here the presence of Germans is significant for another reason. It means there are never any chaises available, as they have all been reserved by Germans who placed their towels on the chaises at 7.30 am, but have yet to appear on the beach, as there is still food left on the buffet table. Regardless of whether the tourists are German or not, they do all seem to be from a class of which my mother would not approve, and one that I strive unsuccessfully to accept. For one thing, they like to camp, something I am extremely reluctant to do, which is rather an understatement. And if they are not camping, they are traveling in a car with a caravan (trailer to you Americans) behind it, which they might consider a step up from camping, but I most certainly do not. Caravans are something that up till now I have paid no attention to, as they never have, and hopefully never will, play any sort of role in my life. But all of a sudden they are constantly in my field of vision, interrupting what would otherwise be a beautiful day’s drive. Given the chance to study them up close, I am discovering that there is even a class system within the caravan owners. There are the glamorous, modern and well cared for caravans which are few and far between on the roads of Istria. The rest come from caravan rental lots that litter the countryside, where you can (well you can, but I wouldn’t) go in and inspect the caravans and find a suitable one to drag behind your car for the next two weeks. These cosmetically challenged caravans, like the tourists inspecting them, are a sorry looking bunch that has clearly seen better days. But even in their heyday they could never have reached a status above economy class. The thought of actually sleeping in one of these tiny homes on wheels that has been lived in by so many different families over the past God knows how many years has no appeal whatsoever to one striving for a little fabulosity. But clearly, in Istria anyway, I am in the minority. The roads and campsites are full of people who find them a perfectly acceptable way to travel. I could be truly fabulous and just ignore these other tourists with whom I find myself sharing the delights of Istria, if only I could find one of those idyllic secluded beaches that I have read so much about. But every time we find a promising looking lane, turning off in the direction of the sea, we follow it with great anticipation, only to find it ending at a fence with a gate. The fence surrounds a huge campsite, presumably to keep people from getting out because lord knows no one would want to get in. The gate has a gate house, from which an officious looking person emerges, looking as if he would be far more comfortable with an Uzi strapped to his chest and wanting me to pay for the privilege of reaching this secluded cove which I can then share with hundreds of economy tourists, their overexcited children and brightly coloured airbeds. Porec, the largest resort town and Pula which is where we are staying. These cities all have old sections full of narrow streets down which cars (and caravans thankfully) are not allowed to drive. They are fascinating areas to explore, full of cafes and restaurants with inviting tables lining the passageways and squares. But the tables are the only thing inviting about them. The food, without exception, is terrible. It is the land of meat and potatoes. The meat is usually advertised as being served with two vegetables. This we quickly discover means potatoes cooked in two different ways – boiled and fried – and placed on the plate either side of a completely unrecognisable piece of meat that has been cooked until dead. The boiled potatoes are the hardest part of the meal to eat. They are charmingly described on the menu as “salty potatoes”, which prevents any lawsuits that may arise from diners who find their blood pressure has risen to alarming new heights after eating them. They appear to be cooked in boiling water with a lot of oil and huge amounts of salt . After eating, my mouth is lined with oil and I am awake all night drinking endless glasses of water. There is only one restaurant that earns rave reviews and that is the one housed in the small hotel we are staying in. Of course it is! 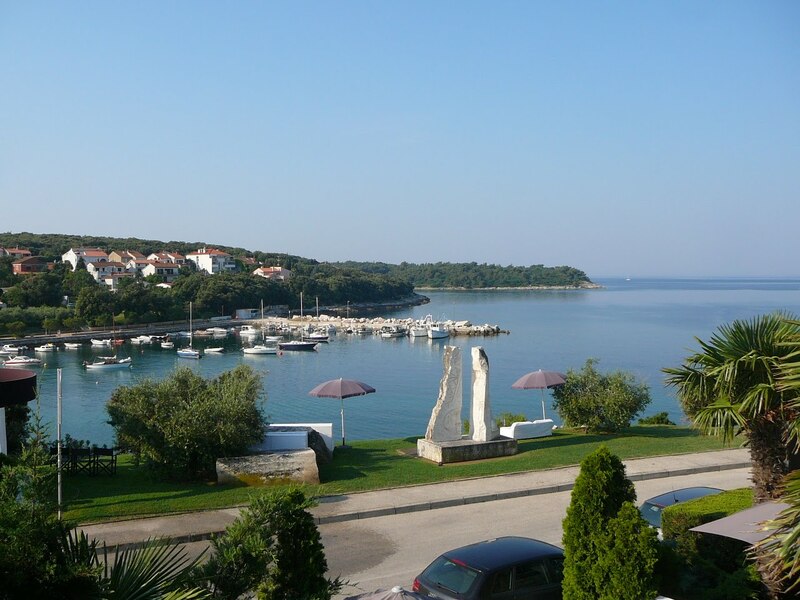 In fact the restaurant has been voted best restaurant in Croatia every year for the past 11 years, and it was for this reason that we booked our accommodation . However, nowhere was it mentioned that it is also the most pretentious restaurant we have ever come across and the fixed price for their menu is $100+. Having spent the last three weeks eating wonderful food on the Nautica we have no need of this place. All we want is some simple grilled fish straight from the Adriatic, served with a perfect salad. But this proves impossible to find. 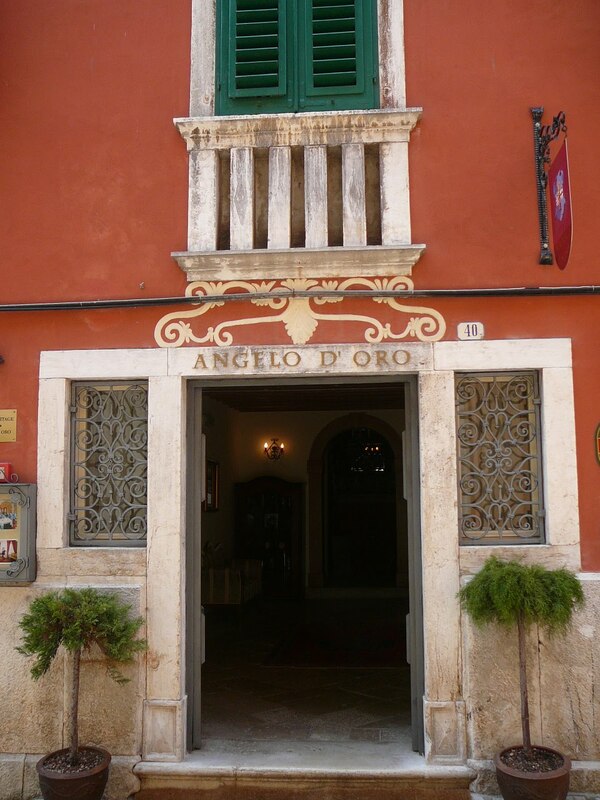 The hotel itself is situated in a charming small village a couple of miles outside Pula. 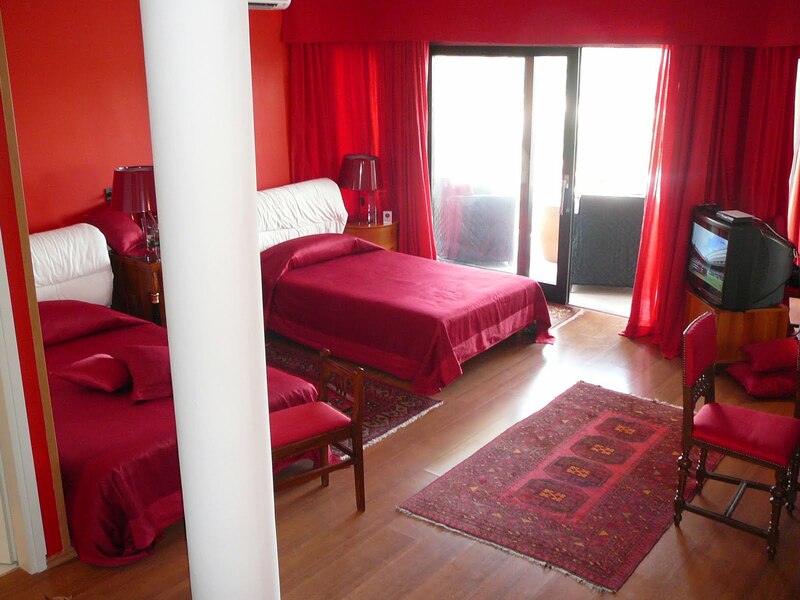 There are just 10 rooms and we have one facing the sea. There is a large balcony with a delightful outlook, and it is just steps from the rocks from where we can swim unencumbered by campers and caravaners. The designer, a rather flattering term for whoever put the room together, has tried to go for an eclectic look. There are some nice pieces of turn of the last century furniture together with an old wind up gramophone, all mixed in with a large amount of instantly recognizable furniture from the turn of a completely different century. Someone is a big fan of Ikea, and it isn’t me. Actually that isn’t true. Ikea is great when carefully chosen and placed in the right setting, but a 4 star hotel room is not the right setting. And an Ikea bed and mattress only belong in a child’s room, or guest room, and this is neither of those. Perhaps Ikea is not found in Croatia and the designer is hoping that the guests will merely see slick furniture and not cheap slick furniture. But if that is the case, they shouldn’t accept gay men as their customers. 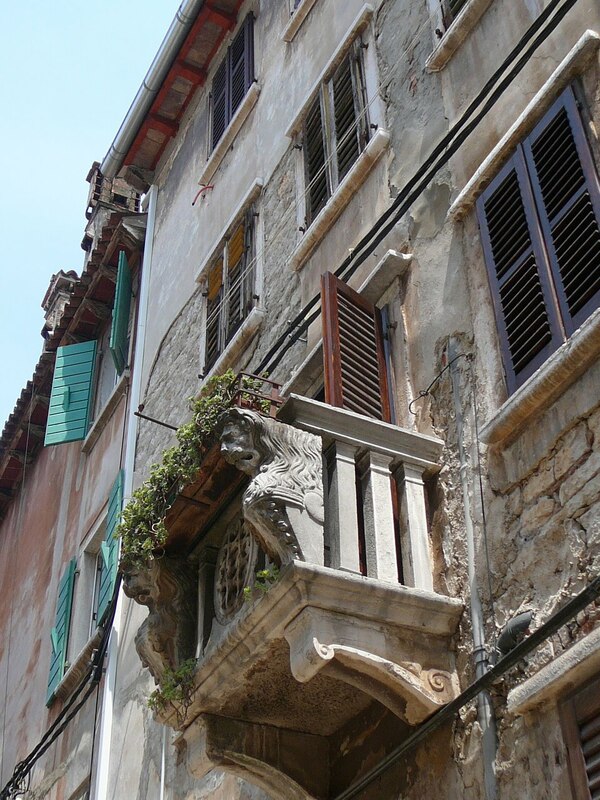 Like so many things in Istria, it looks striking from a distance, but up close its cheap and tacky. Next stop is Italy, which is certainly not cheap and could never be called tacky. 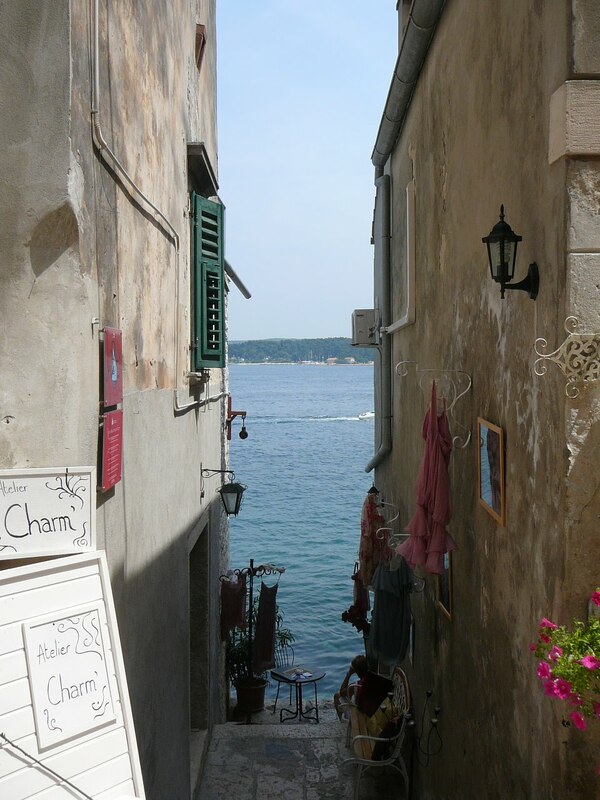 This entry was posted in Croatia, Istria, Pula, Rovinj. Bookmark the permalink.